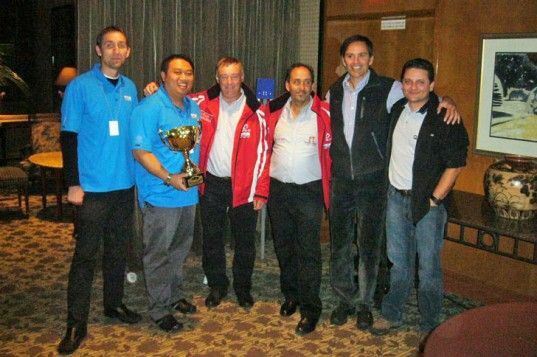 (MONTREAL) –Toyota Canada has won the Rallye Vert de Montral, a world championship of “green” rallies, as part of the FIA Alternative Energies Cup, and has placed first in consumption, for the second year in a row. Driving the overall winning Prius Plug-In Hybrid was Toyota Canada’s Advanced Technology and Powertrain engineer Vinh Pham, with seasoned rally racer Peter Nytko as navigator, who is also from Toyota Canada. The second Prius Plug-In Hybrid was driven by Stphane Quesnel with navigator Sonia Arguin, and placed 2nd in consumption. “We’ve shown Canadians and drivers everywhere that the Toyota Prius Plug-In has a very efficient and powerful powertrain and that the Prius vehicles we entered truly showcased our superior green technology on an international stage," said Stephen Beatty, Managing Director and Chief Environmental Officer of Toyota Canada Inc. “Toyota's plug-in technology helped us get back to first place by providing zero-emission driving balanced with a lighter battery for long distances. When the rally stopped for short rest periods, our reduced charging time meant that we were always able to compete." Driving the Prius was Raymond Durand – who has won the FIA Alternative Energies Cup championship two years in a row, as part of Toyota Canada's team, and finished 4th place overall in this year’s Rallye International Vert de Montral. The Rallye Vert de Montreal took place this past weekend, covering a distance of 600 kilometres and challenged eco-friendly vehicles to be as efficient as possible. Rally results and blog posts and pictures can be viewed at Toyota Canada's Prius Plug-in Facebook page: www.Facebook.com/ToyotaCanadaPriusPlugin. For more information about the FIA's Alternative Energies Cup and the Rallye International Vert de Montreal, visit www.fia.com/en-GB/sport/championships/Pages/alternative.aspx and www.rallye-alternative.com respectively.